that's a deal. You might want to post up that mans info if he's ok with it. That's a service many vintage guys could want. "that's a deal. You might want to post up that mans info if he's ok with it. That's a service many vintage guys could want." I actually found him on Fleabay. His seller name is transcendar. In all seriousness -- Looks good. I love it. Now, for full disclosure, this is actually a kit version that we got this past year at Carver Fest, and not one of the actual production amplifiers. This particular amplifier does everything very well. Wide three-dimensional soundstage. Great separation of the instruments. Excellent imaging. The sound quality is fantastic. And surprisingly good bottom end bass control. I haven't owned any ridiculously expensive gear. No $10,000 amplifiers or $20,000 speakers. 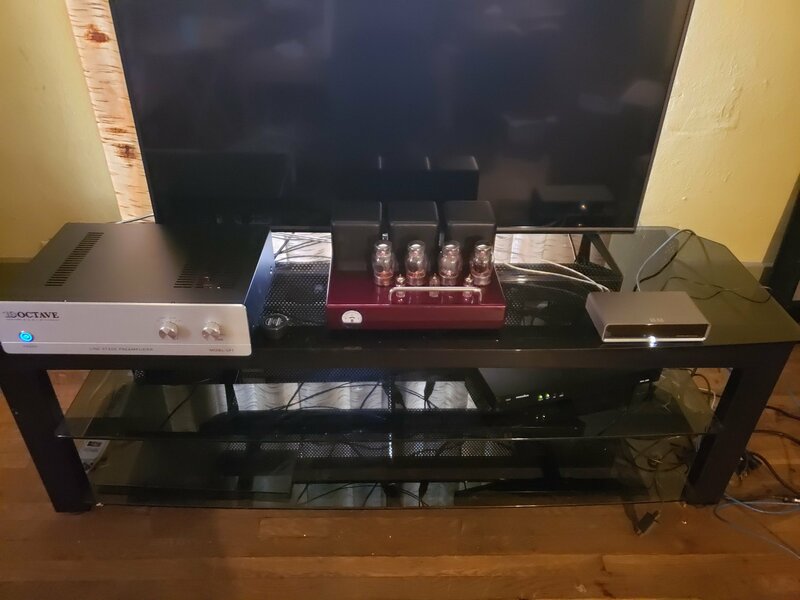 But, I have owned a few amplifiers at the same price point as the Carver 275 and I would take this over anything else I have owned. I haven't really been following this thread, so I don't know any thing about what occurred with Frank or anyone else. If I'm buying any of the new Carver stuff, I get it from Jim Clark stereo in Rockford. Jim is the kind of dealer that is a pleasure to do business with. He offers no-hassle return on all of his products. but, I know that getting stock on the Carver amplifier has been the biggest problem. Jim has actually sold a couple dozen of the Carver 275 units and has not had any issues with any of the transactions. Of course, he has have the same problem as many of the dealers where he has not been able to receive stock nearly as quickly as he would like. but, he's generally upfront about what the potential wait time would be on an item to avoid any issues. I really like the Elac. I was surprised at how good the onboard DAC sounds. Good enough that I wish it had in imput option on it so that I could run other digital units through it. Well, now Travis......according to some folks here....your observations are useless because you know Bob, therefore you must be biased and your opinion is null and void. Glad to see you posting here bro'! Frank? Well, just read his "introduction" on this thread. It was quite embarrassing....but we have since moved on. Bob is no different than any other designer. He has stuff I like, he has stuff I don't. I don't know a lot about electrical engineering or design. So I don't have any biases on how something is built, or what I think it should be able or not be able to do. I plug it up, listen and see what I think. I don't have room treatments, or an ideal listening Room. Just a normal living room that we actually, well, live in. It's got a couch, loveseat and various items taking up space in the room. It's not an optimum listening Room. So, all I can talk about is how the stuff sounds to my imperfect ears in my imperfect room. In here, it sounds great! Maybe if Russ gets some time, he can swing by and listen to it! Then he can give his impressions. What loudspeakers are you using it with? I concur. I've tried quite a few DACs and none have beat out the onboard DAC in the Discovery. Sounds like a good combination; certainly any shortcoming in the amp would be revealed by those, so the amp must be working well in that setting. I'm thrilled with it. I don't have the Golden ears that some people have. I can't hear a significant difference in the brand of capacitors, or cables. But, I know when something sounds bad, and nothing in this system sounds bad to me at all. It seems to work very well together. Not to derail,, but how do you like that pre? I really like it George. Those guys down in GA built a really nice product. Jerry had it at his house for a while and really enjoyed it as well. I've been using my 275s(I have a pair)almost nightly since I got home from TheFest. Unlike Travis I have owned amplifiers that are quite expensive and tubed the way it is now it can hold it's own. For those of you making it to Axpona you'll get to hear it there. Get an ear on it, I really like what I hear. In the next couple of weeks(if work cooperates)I'm going to do a head-to-head with my EAR Yoshino V20. If what I've heard so far is any indication the 275 will fair well. Hey Frank... thanks for the invite! Unfortunately, Of the dozen or so members of this community who dropped by to hear the amps and speakers, and meet you in person, they all left before they heard anything. They did however, hear you drivel on for quite a long time about your favorite topic.... YOU! They dropped in multiple times to hear Bob's amazing gear, but instead heard about cheap toupee's, Bob's net worth and a host of other things that Bob would have been mortified to hear come out of your mouth, but once again, no music. You're an embarrassment to the Carver name and company. +1 on what was said above. Other forms were saying the same things so it is not just our opinion. We would have loved to say hi to you and hear what the amps and speakers could do but both times I tried, you were just going on and on and on. Needless to say, I am not a big fan of any generation of Carver-designed products I've encountered (to date), but the man (Bob Carver) was/is an important figure in the development of modern hifi, and he deserves better in the golden years of his career than what he's apparently gotten from his colleague(s). On the other hand, presumably he (Carver) can do as he pleases, and associate with whom he pleases. Heck, I'd still like to hear one of these amps, but the way things have played out put me off of trying one myself. I'd like to think I'm fairly opened minded (ah ah ah...peanut gallery sit back down...) and I did go to that room to hear the equipment. I heard Frank ramble on about "growl" or some such. He talked for a couple of minutes about what I was about to hear and then played less than 30 seconds of some obscure track. I'm not sure what I heard, it could have been the line stages bottoming out for all I know. He also blamed his assistant for playing the wrong track at some point. He had no idea how the equipment was setup either and admitted to such. Most disappointing room at AXPONA and worst room I've been in ever. And it wasn't because of the equipment. Please don't tell me what I should hear. Play something that is recognizable. Allow the audience the option of voicing in on what they heard. And please leave personal Bob Carver stories out of all conversations. I don’t want to cross link forums, but could you maybe cut and paste quotes from the other sites here? When I talk to Bob next week, maybe I can direct him to this thread so he can see it for himself. Maybe @erniejade could PM you, John (even I feel a little weird airing this sort of dirty laundry in "public"). That said, Mr. Carver's gotta know what he's dealing with in terms of his associate(s), right? Sent a PM to John. And all this being said, I'd still love to get one on home for a listen. Curious.